Our St. Francis School Elementary program continues to nurture the Catholic values instilled at home while providing students with a strong academic curriculum. Students learn about God’s love through daily religion lessons and classroom experiences. Parents and teachers work cooperatively to build a partnership between home and school. A strong core academic curriculum is the main focus of the third grade. In addition to the core curriculum, a wide range of instructional methods are offered to help the children learn both formally and informally. The third-grade curriculum is an integration of skills learned in Kindergarten through second grade. It enhances these skills through an in-depth understanding of process and procedure. The St. Francis curriculum meets both state and Diocese benchmarks and standards for the third grade. St. Francis offers a strong and varied academic curriculum for third grade students. Catholic faith is taught throughout the year with the assistance of a textbook. Christ Our Life encourages the lessons and lifestyles that Catholics should practice. In addition to classroom prayer and teacher guidance, the text provides a historical perspective on the Catholic faith. We show Jesus that we love and respect the awesome gift of His true presence in the Eucharist as we participate in Eucharistic Adoration each week. In response to a diocesan movement, we are also focusing on the prayers all Catholics should know by heart. 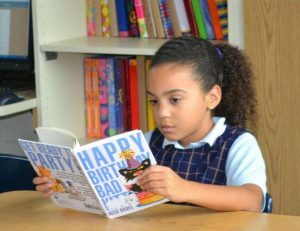 In third grade we work to develop a more in-depth understanding of literature through a balanced literacy curriculum. Third graders use novels and informational texts as the main components of the third-grade curriculum. Reading instruction consists of developing vocabulary, comprehension of material read, and appreciation of various types of literature. We learn to apply multiple strategies that help us delve into both fiction and nonfiction and refine our abilities to make meaning from the text. An integral part of third grade is to develop our students to be fluent and lifelong readers. To differentiate instruction teachers use a variety of instructional approaches including conferencing, reading in literature circles, and responding to our reading through writing. We strive to meet each student where they are in their reading development and to encourage students to interact with the text in various ways. Third Grade uses the Wordsmith Program by CR Success Learning to instruct students in Phonics and Spelling. Explicit instruction of letter-sound relationships help students refine their word attack skills in reading and spelling. Students will also be exposed to instruction on prefixes, suffixes, base words and word meanings. We extend the spelling practices through our writing workshops which allow students to apply their spelling skills. As students develop a rich collection of writing pieces in their journals we begin to incorporate their own misspelled words into their spelling lists. Spelling lists go home on Mondays and students have all week to review the spelling words. They are exposed to the words throughout the week through varied spelling activities. Additional practice is accomplished through the construction of the words. We find that this provides an expansion of vocabulary and a base to practice our phonetic reading skills. We use Zaner-Bloser’s Handwriting curriculum to formally teach handwriting. All third-grade students receive instruction in cursive handwriting. Students are given ample time to practice and are expected to work toward the development of cursive skills. Children are encouraged to use cursive in regular assignments by January. By using the Writing Process (which includes prewriting, drafting, revising, editing and publishing) students learn to produce written products in a variety of styles. Students experience writing paragraphs, stories, poems, letters and a variety of texts across the content areas. We also devote a special focus to a developmentally-appropriate research essay in association with our school-wide Science Fair. Students are coached through writing strategies using the Write Source curriculum as a support. Grammar is taught explicitly and practice is integrated into the writing curriculum to ensure proper mechanics and usage. The third-grade math curriculum provides students with valuable skills to use mathematics in and out of the classroom. Teachers use a math textbook My Math (Macmillan McGraw Hill) to guide their math lessons but supplement materials and instruction as necessary to address student needs. One major focus in our program is the mastery of multiplication facts and the introduction of division facts. We practice an interactive approach for learning math skills with the help of hands-on and manipulatives. There are many topics that we visit throughout the year including adding and subtracting whole numbers and money, using geometry, multiplication and division, fractions, and measurement using both US standard and metric units. By pre-assessing students before each new topic of study we are able to evaluate the abilities of each student and utilize a math enrichment teacher to provide each child with the support or advancement they need. Social studies is an integral key to becoming active citizens of our world. Social Studies in third grade focuses on Michigan history. We use the text, Meet Michigan, to learn about the State of Michigan through a mixture of informational and narrative text. We explore the early history of Michigan, the steps of statehood, the major events and people who have impacted our state, and the basic structure of our current government. The highlight of our year is traveling to Lansing to visit the State Capitol and the Michigan History Museum. The third-grade science curriculum, Science: A Closer Look, by McGraw Hill, is based on the principle that the most effective way for students to learn science concepts is through a balance of hands-on activities and solid content knowledge. The students are taught to use scientific process skills, critical thinking skills, and scientific reasoning to solve problems and answer questions. They are able to put these skills into practice during visits to the science lab and frequent in-class mini-labs. Through scientific inquiry, major topics in the areas of life science and physical science will be presented. Elementary choir is provided for those students interested in choral music. This group is composed of third- through fifth-grade students and meets one to two times a week during recess. The choir studies singing in parts and good vocal techniques. They perform in the Christmas concert, lead the all-school Masses and sing for the community throughout the year. The focus of the primary grades’ art curriculum is to build interest and confidence in creating art. The art concepts of cutting, shape recognition, drawing, color wheel, painting, paper construction and clay construction are taught in a cumulative fashion through both two-dimensional and three-dimensional projects. There is also an introduction to the artwork of different cultures and various artists. Students attend a weekly 45 minute computer lab session led by a technology teacher. During this time, the technology teacher integrates third grade curriculum concepts into technology instruction. Students learn to safely and efficiently navigate relevant parts of the internet, design projects and presentations, utilize basic Microsoft Office programs, and practice their keyboarding skills. Spanish class students will become acquainted with the Spanish language through fun, entertaining activities with puppets, music, picture cards, stories, skits, projects, and vocabulary games. Learning about countries and cultures of Latin America and Spain will also be part of the Spanish program. Grades three through five will also become acquainted with the Spanish language through cross-cultural explorations, as well as interactive and fun activities that include music, stories, projects, skits, and games. The vocabulary will increase in order to achieve a higher level of comprehension and conversation. Grammatical concepts are introduced and practiced through conversation and fun activities and games. Beginning reading and writing continues with more emphasis at this time. Hispanic Catholic faith and culture is presented with short prayers, songs and traditions. Field Trips: Third-grade field trips focus on supplementing our social studies curriculum. We visit the State Capitol to bring our Michigan government content to life and we attend Rural Education Days to explore Michigan’s agricultural contributions. We also participate in the Michigan Wildlife program at the U of M Museum of Natural History. Homework: Homework is assigned on a daily basis Monday through Thursday. Students have an ongoing responsibility to grow in their reading and math skills by also reading 30 minutes each night and practicing math facts at home. Occasionally students will engage in long term projects like book reports and a research paper for the Science Fair. Looking Ahead:Every Monday a weekly newsletter from the third-grade teachers is emailed out. It highlights the curriculum and important information for the week to come.